Multi-Asset class indices are key. Multi-Asset class indices which outperform equities are even better. Investors need to understand the value of currencies as synthetic equity hedges. A synthetic long dollar position is, in certain scenarios, superior to a put option which melts in our hands due to time decay. Understanding the flow of money between risk assets and cash can provide interesting macro insights. I. Buy ZIV (NASDAQ:ZIV) with 15% of the dollar value of the portfolio. III. Buy TMF (NYSEARCA:TMF) with 15% of the dollar value of the portfolio. IV. Buy EUO (NYSEARCA:EUO) with 20% of the dollar value of the portfolio. V. Rebalance annually to maintain the 15%/50%/15%/20% dollar value split between the instruments. Investors need a strategy index which allows the investor to hang on during massive equity market drops in order to enjoy the bounce backs. The low correlation of this index to the SPY helps achieve that goal. Indeed, in 2011, the S&P 500 had an almost 20% drawdown. The index only dropped 5%. This allows investors to hang on emotionally and enjoy the subsequent rise. The components of the index were chosen for logical reasons. ZIV tends to truly shine during a sideways market, because it is often pocketing contango, or synthetic time decay. TMF through its long duration government bond exposure and EUO through its synthetic long dollar exposure provide the hedges for the strategy. In addition, in a rising interest rate environment, long-dated government bonds often get slammed, but the higher interest rates lead the dollar to strengthen, causing the EUO ETP to appreciate. Investors need to understand that currencies can be an excellent synthetic equity hedge. Across a broad range of probability scenarios, a currency hedge which benefits from a rising interest rate environment which can hit both stocks and bonds is extremely valuable. If we agree that money (in the simplest sense) flows, due to the risk preferences of investors, between risk assets and cash, therefore, as money flows out of risk assets, it often (but not always) flows back to cash. And, the very high sharpe compared with equities proves the wisdom of this notion. 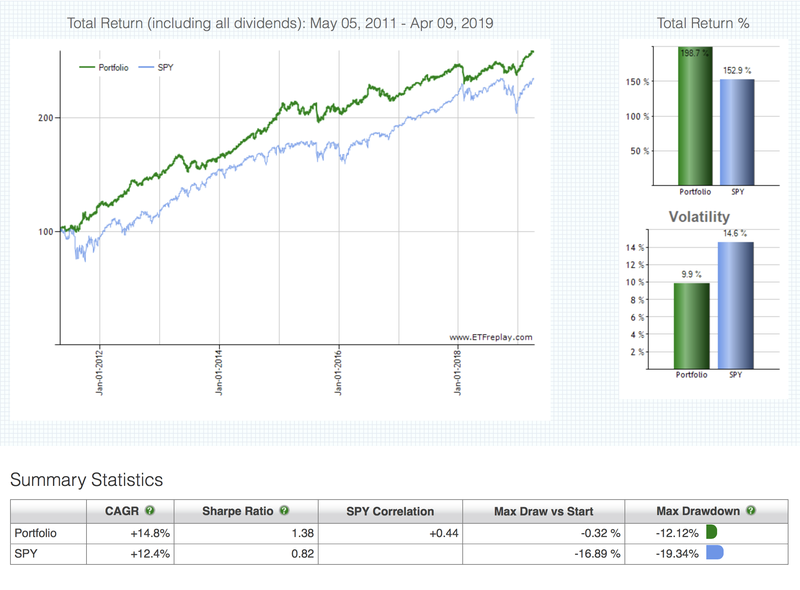 The intuition behind this strategy index is that it generates return through the SPLV S&P 500 low volatility ETF and the ZIV inverse Mid-Term volatility ETN. ZIV tends to truly shine during a sideways market, because it is often pocketing contango, or synthetic time decay. In addition, in a rising interest rate environment, long-dated government bonds often get slammed, but the higher interest rates lead the dollar to strengthen, causing the EUO ETP to appreciate. As we've seen, the components of this index were rationally chosen, and the performance reflects that. Thanks for reading. We feature even more impressive strategy indices in our subscription service. If this post was useful to you, consider giving it a try.